I began thinking of the way mosaics are fashioned from broken shards of pottery and pieces of splintered glass… Think about the way our lives are shattered with that first diagnosis. … How we work and work at gathering up the pieces, attempting to rearrange them into the familiar pattern we knew before. How we keep striving to create something new. Parenting a child with a disability or chronic illness is hard work. It will most likely be the hardest work we will encounter in our lives. Keeping up with the research alone is a job that could swallow a person alive. Add to that negotiating daily life—trips to the grocery store (disruption of routine), doing the laundry (chaos), serving family meals (beware the picky eater), getting out the door to go to work (Are you kidding? ), and finding the best schools for our children’s needs (Help!). Yet overriding all of the above is our deep and abiding love for our children. Fragile hearts are a condition of our humanity. Our hearts break as we observe our children’s struggles and anxieties; watch a nurse hook them up yet again to an IV; see them left out of a neighborhood game; or witness their daily meltdowns, aggressive behaviors, or inability to voice their thoughts and feelings. And so we work. We work until we’re numb, finding the right doctors, the right therapies, the right schools, the right medications and supplements, the right diet, the right parenting techniques. Our to-do lists grow exponentially. We expect the lists to shorten as our children get older, but instead, we find them growing. And we become very, very tired. Where do we go for solace? For rest and refreshment? For an infilling of joy? We know where to find those things for our kids, but where do we find them for ourselves? Henri Nouwen is one of the great spiritual teachers of my life. I never met him in person, but I knew him intimately through his books on the spiritual life and his work with adults with disabilities. In his book Spiritual Direction: Wisdom for the Long Walk of Faith, Nouwen defines spiritual direction as a relationship between someone who is seeking after God and one who has already walked this path and is willing to listen to, pray with, and respond with wisdom to the questions the seeker is living with. I have been seeking God in the midst of my son’s disability for more than twenty-eight years. Meditating on and writing about this journey has grown into my life’s work. This walk with Joel’s disability has led me to my own spiritual director and to becoming a spiritual director myself. It is my greatest desire, in the pages of this book, to walk alongside you as you seek answers to the questions that are rising up in your heart, and to help you pay attention to God’s presence in your life. I will give you some questions to ponder and some reflections to consider, so that the words on the page will become three-dimensional, turning into lived experience. The pages of this book are also filled with stories from other parents who have walked similar paths with a child’s disability or chronic illness, and who have encountered God along the way. Best of all, you’ll find a treasure chest full of ancient traditions—the spiritual disciplines—for us to explore together. These are traditions that have been a part of the Judeo-Christian experience for thousands of years; traditions that draw us ever closer to God; traditions that heighten compassion for our fellow travelers, fill us to overflowing with the joy of the Holy Spirit, and, amazingly, lower stress at the same time. Could you use a little less stress in your life? I thought so! As I pondered the theme of this book, an image of a mosaic kept coming to my mind. I began thinking of the way mosaics are fashioned from broken shards of pottery and pieces of splintered glass… I’ve been thinking of how the artist fits these pieces together; carefully arranging and rearranging them so that the broken edges piece together like a puzzle, forming a beautiful and elaborate pattern. What a wonderful metaphor for our lives as parents of children with disabilities. Think about it. Think about the way our lives are shattered with that first diagnosis. How we wake up the next day, realizing that our lives will never be the same again. How we work and work at gathering up the pieces, attempting to rearrange them into the familiar pattern we knew before. How we keep striving to create something new. If we allow it, God, the master artist, will help us bring those broken pieces together. God will, in infinite love and compassion, work alongside us, helping us to rearrange the pieces into a work of beauty that surpasses the beauty of what our lives were before. 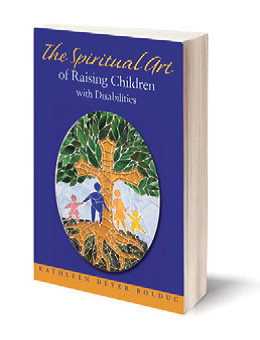 Excerpted from The Spiritual Art of Raising Children with Disabilities (Judson Press, 2014). Used with permission.